Resort open May 1 - Sept 30. 9 am - 6pm. Contact us year around for reservations. 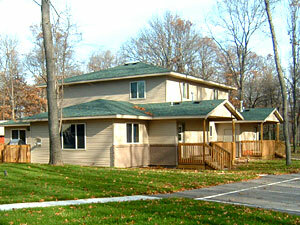 Shing Wako Resort, near Brainerd, on Lake Edward is your ideal family resort. A quiet and relaxing place to swim, fish and enjoy family time. We have a sandy swimming beach with clear water and very gradual depth. We offer multiple lodging options for any size family reunion. Guest Satisfaction in our Reunion Lodging is excellent. We offer many on-site amenities for all ages and a very family friendly atmosphere. Play on our eleven park-like acres or learn to ride your bike - every year kids do! Free for guests include paddle boats, canoe, kayaks, swimming tubes, horseshoes, tether ball, basketball, volleyball. Board games, books, magazines, and sports equipment to share. 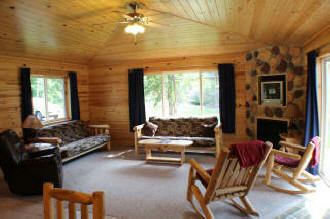 Inside Reunion Lodge 19 - Living room! 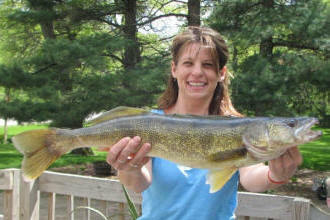 A Memorial Weekend Walleye caught at Shing Wako Resort on Lake Edward! Relax and enjoy the sun, sand and water on one of our beach loungers! Kids love the playground, it's near the beach too!